This news archive began life in support of the initial Cornwall Campus Project and the original choice (now defunct) of Penzance as the campus location (arrived at through a fair and honourable contest at the time), The following more recent news items while heralding a new beginning to further education in Cornwall are also an extended epilogue for the original project and this unofficial record of events. News may appear here occasionally but the primary purpose of this web site is now that of a historical record of the initial project. For current information on the Combined Universities in Cornwall initiative (CUC) see the official site at http://www.ex.ac.uk/cuc/. OTt has no connection with any persons or bodies directly involved in the now defunct University of Cornwall Initiative or its successor, The Combined Universities in Cornwall initiative (CUC). These documents are provided solely as an information service in the public interest. The FINAL major piece of funding that guarantees the building of Cornwall's first university has been secured. The £44.8 million is the last piece in the jigsaw for a project which an economic impact study has estimated will generate £32 million a year for Cornwall's gross domestic product (GDP) and create an extra 1,000 jobs. The funding is officially due to be announced this morning. Falmouth and Camborne Labour MP Candy Atherton said: "I am absolutely delighted. We are already seeing the benefits of the embryonic university and this final funding will see the transformation of the economic and social fortunes of the Falmouth and Penryn area." The CUC is regarded as the key project for Objective One in the county. Those driving the scheme through have high hopes that it will encourage graduates to stay and work in Cornwall, increasing employment and the overall wealth of the county. The South West Regional Development Agency (SWRDA) has demonstrated how important it believes the CUC is for the county by contributing £12.78 million to the £44 million package, of which £10.6 million will go towards building the university hub at Penryn, with the remainder earmarked for future CUC development. Drawings for phase one of the £40 million main campus building at Tremough, Penryn, have already been released. The roof of part of the 20,000-square-metre campus has been designed as a fully accessible series of landscaped terraces stepped down the side of the hill and will be planted with local species, grasses and shrubs. Stephen Bohane, head of operations for SWRDA in Cornwall said: "This is SWRDA's biggest investment in Cornwall to date and is a measure of how important we regard the CUC as a catalyst for economic regeneration across the county." THE Combined Universities in Cornwall (CUC) project is to receive almost £10 million of Objective One money to spend at the six Cornwall College sites across the county. The funding will enable Cornwall College to deliver a range of higher education facilities to complement those that will be offered at the CUC's main campus at Tremough near Penryn - where work on the £40 million main campus building is expected to begin shortly. The latest investment will create eight new buildings with the latest teaching, computing and scientific equipment. The government has pledged £19m towards the scheme, which is also being supported by the European Structural Fund. See also Ready to rock, "Cornwall hopes its university-in-waiting will kickstart its ailing economy, reports Donald MacLeod" in The Guardian, Tuesday May 15, 2001 and Funding agreed for Cornwall University, first published on Monday 14 May 2001. 24th July What more do you need? 11th July News of Millennium Commission rejection breaks. Early 1997 Decision not before Spring. This section is retained for historical interest. It is also a reminder of what might have been had there been within Cornwall (and outside) more co-operation and less division. 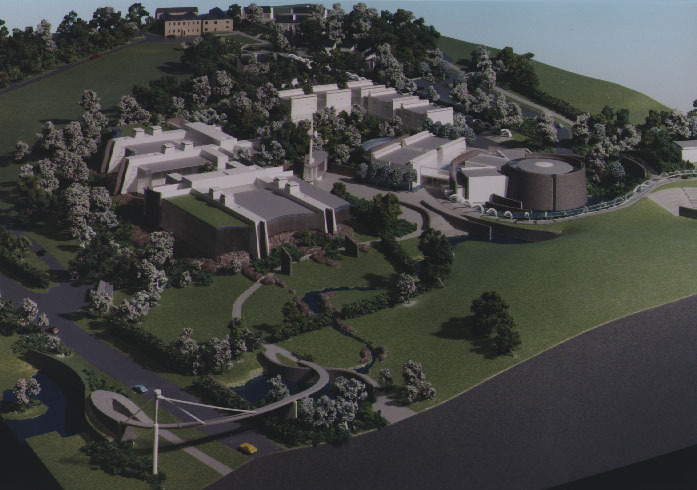 Drawings and designs for the new campus, produced by architectural consultants Robert Rummey Associates and the Architects Design Partnership were first published at the end of October 1996 in the Western Morning News and The Cornishman. In November 1996 a two day public exhibition of drawings and designs took place with representatives from both the architectural and academic sides of the project on hand to answer any questions. The photograph below is one view of the architecture's model of the central area of the site. The plans show more facilities to the east and north. The view is from the east, the bridge in the bottom left corner traversing the A30 Penzance to Land's End road. Vice-Chancellor of Exeter University, Sir Geoffrey Holland, headed the original project and is a partner in the current Combined Universities in Cornwall initiative (CUC). Information about the Camborne School of Mines.